This sponsorship is brought to you by the Soyfoods Association who we have partnered with for this promotion. My first food was soy. You see I was born allergic to milk. I was raised on soy milk and tofu and I've never had a weight problem or high cholesterol. Soy is a low fat, vegan protein that also contains iron, calcium, zinc, and it is a source for vitamin B12 which can be lacking in a vegetarian diet. Fortunately my children did not inherit my dairy allergy which I did lose when I got older, but I still include soy as part of their diet. 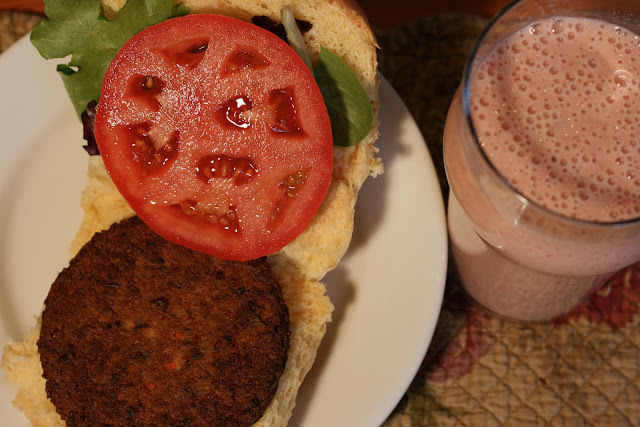 My kids regularly eat soy burgers, breakfast sausages, and their favorite: tofu marinated in apple juice. Yes, this dish was one of their first solid foods. Tofu is easy for a baby to eat and it is a terrific protein source. My kids still ask me to pack it for lunch. 1) Chop tofu into approximately 1 inch cubes. 2) Put tofu in a sealable container. 3) Completely cover with apple juice, cover, and refrigerate for at least 2 hours before serving. PS: Babies really like picking up these cubes with their fingers. It's good for their dexterity! Products I was sent to review. Enough with the children... lets get back to the adult treat of a guiltless burger and shake. It really is guiltless when you make this meal with soy. I used Wildwood's Sprout Tofu Shitake Veggie Burger. It was only 170 calories with 11gs of fat. Let me tell you the addition of mushrooms really made this burger tastier than other soy burger's I've eaten. Nothing about the taste or texture is so unusual that a primarily meat eater wouldn't enjoy this burger too. As far as the shake... 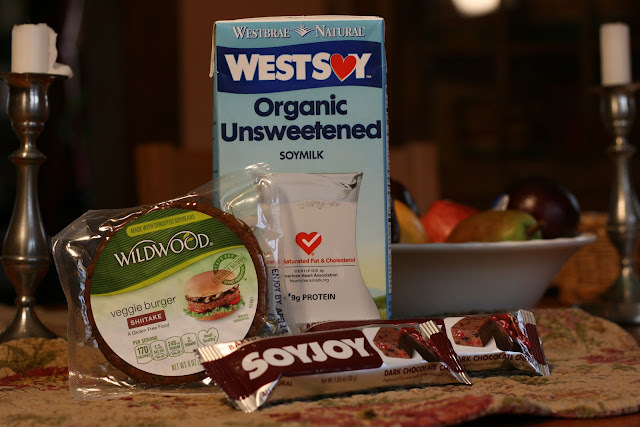 I followed Westsoy's Power Fruit Smoothie recipe which includes Westsoy's Organic Unsweetened Plain Soy Milk. It tasted like a real shake made with low-fat milk... I couldn't tell that it was all soy. 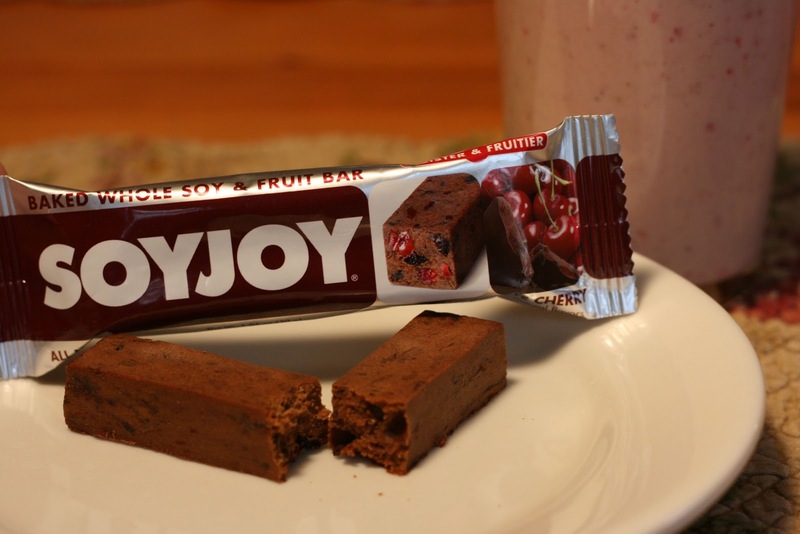 A little later in the day I sampled the SOYJOY bar. I had the chocolate cherry flavored. The cherry really popped, it was moist and just the right size and calories 140, for a mid-meal snack. April is National Soyfoods Month so it’s the perfect time to learn about the place for soy in a healthy diet and easy ways to incorporate it into everyday meals. Packed with protein and fiber, soyfoods are a tasty way to reduce calories, saturated fat and maintain your weight. Many soy products like veggie burgers cook and thaw faster than traditional meat sources so that means more time and convenience—who couldn’t use more of both? The Soyfoods Association of North America (SANA) provides information about the health benefits and nutritional advantages of soy. SANA offers fun recipes and convenient ways to incorporate soy into meals for everyone – from athletes to families. SANA is dedicated to spreading the word about soy, especially during National Soyfoods Month in April! Soyfoods aren’t just for vegetarians anymore. In fact, dishes made with soy are quick, tasty, and often healthier than traditional protein sources. Including soyfoods into your diet is easy and convenient. See the recipes below: Soymilk adds a healthy twist to any smoothie and these scalloped potatoes: Soy Milk Scalloped Potatoes. Edamame makes a great energy-boosting snack and puts in an interesting twist on this hummus: Edamame Hummus. For more easy recipes to get cooking with soy ingredients click on: Easy recipes to get cooking with soy. Sunday: Cod and Spinach Roulades from Around My French Table Cookbook. Good info. I have always wanted to try soy, but never knew much about it or what kind to purchase. Def trying now. Thanks for the info, Diane. If you are calorie conscious soy is the way to go. It is also good for woman as we get older. Thanks for the ideas. I am featuring this at My Meatless Mondays.